MASSILLON, Ohio — Over eight decades ago 70,000 steelworkers, including many new to our country, walked out of Republic mills, in the tough, violent strike that became known as the “Little Steel Strike.” That fight was over the basic right of workers to form and be represented by a union of their choosing. Steelworkers won the right to unionize, but the sacrifices by workers were heavy. For some, their sacrifice was the ultimate one! 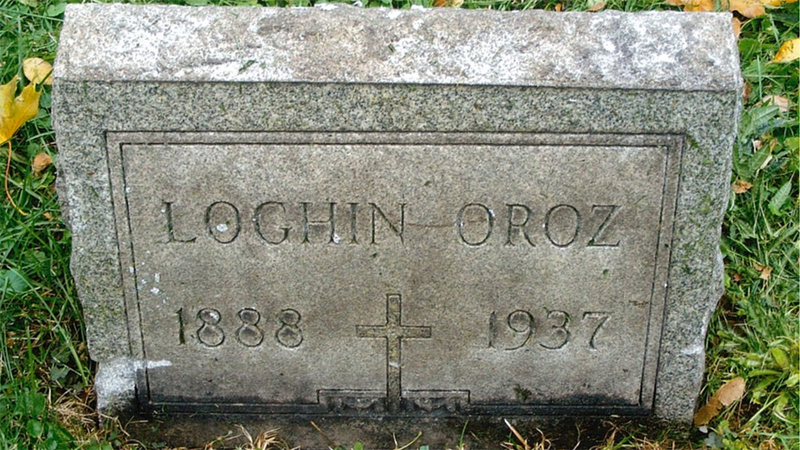 In Massillon, Ohio, one of the centers of that strike, three immigrant workers, Loghin Oroz, from Hungary, Nicholas Vathiaz, a Greek immigrant, and Spanish native Fulgenzio Calzada gave their lives for the worker’s cause. Vathiaz, 37 at the time, and Calzada, 47, were murdered, shot by police, on June 11, 1937, at a peaceful union rally that was attacked by cops. Oroz was gassed and badly beaten. He died a few days later. 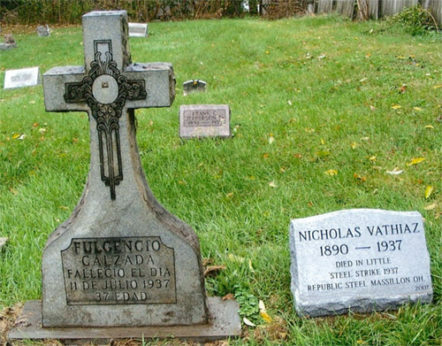 For 80 years these working-class heroes laid in their graves in Massillon unnoticed, their sacrifices not celebrated. That was before Colorado University prof Ahmed White wrote a book, “The Last Great Strike,” about that struggle. 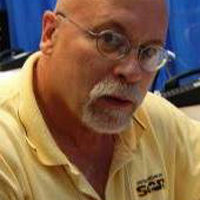 White’s work brought these worker’s lives, and their murders by police, to the notice of Massillon Steelworkers Organization of Active Retirees (SOAR) members. Santilli had spearheaded a push that got an historic plaque put up on the Massillon town square memorializing the “Little Steel Strike” a decade ago. Along with Massillon SOAR Secretary-Treasurer Tom Triesch, they reached out and built a committee to help on this project. First they had to find the striker’s graves. Sue Burton, a pro-union poet who’d lived in the area, told them she’d heard stories of the fights as a child, that she had visited the grave sites, leaving flowers, gifts, and poems. The stones were in poor shape, missing in one, so the committee took up fund raising to upgrade and replace the memorials. 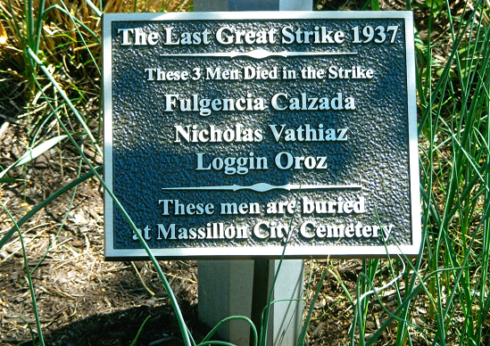 This work culminated May 5 with a gathering of hundreds at the Massillon library, addressed by USW International President Leo Gerard, Ohio USW District One Director Dave McCall and others, to honor the three immigrant martyrs to labor’s cause. For 94-year-old Erasmo Perez, who’d participated in the strike after fleeing his home in Spain to escape the fascist coup Franco launched against the elected popular front government, it meant a lot to have those struggles memorialized. 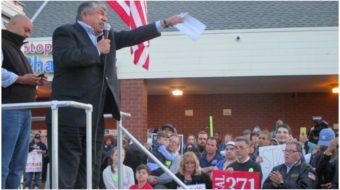 His grandson, Ray Perez, president of USW local 1124 in Massillon, was also present. “I never thought I’d see this. 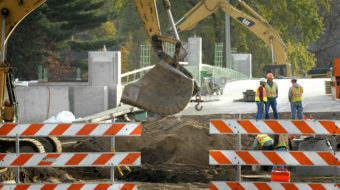 Every time I go past the square now, I can see the appreciation of this entire city for our sacrifices,” he said. “This fight, for working people, is a family affair, it’s in our blood. Massillon Public Library Director Sheri Brown said that since they’d gotten involved in this memorial, many people had expressed interest in learning more about unions and labor history. 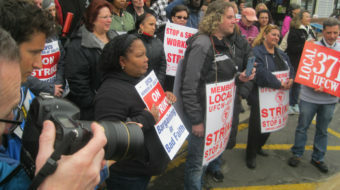 They’d begun working with a student group that is working on a documentary film on the area’s labor history, she said.